Another popular theory is that new LTE chips by Qualcomm, a component supplier Apple is already using, should become available in the first half of this year and, based on published specifications, allow device makers to considerably cut down on battery usage and required space. These new chips are smaller, consume less power and are made by a company Apple already buys components from. 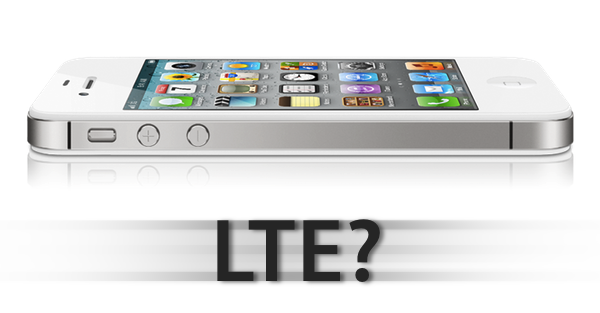 The next iPhone will have LTE! Not so fast. New chips with integrated LTE support from Qualcomm could, in theory, meet Apple's design guidelines: they're produced at a 28nm process that allows for significant power consumption advantages over the existing solutions. Doesn't typically adopt new technologies and standards until they're fairly popular and accepted by consumers. Apple rolls in its very own way. Is willing to make exceptions to get their devices on sale in territories/market segments they really care about. Now, another popular theory I've seen surfacing recently is that of the iPad getting LTE support before the iPhone because of the bigger room Apple may have to place batteries inside. I even reported an article from Bloomberg in which they claimed the next-generation iPad would feature LTE, as it's unusual for an organization like Bloomberg to go on the record with such specifics and alleged product details. Whilst from a superficial analysis it might seem this theory "has legs" and Apple could really deliver an iPad 3 LTE in time for March, I would like to focus on a couple more points. First off is the Retina Display, which seems very likely to happen on the next iPad, and would certainly require more horsepower to move double the pixels than an iPad or iPad 2. The horsepower will apparently be provided by a quad-core A6, and you can see how things start piling up: a Retina display with double the resolution, more intensive processor, more RAM...it's not like the iPad 3 won't have new components to power besides LTE. And so I wonder -- what's the chance Apple has figured out a way to manage the Retina Display and quad-core processing and deliver LTE at the same time? Sure Apple's engineering team is well-known for giving priority to low-power consumption (this has been true with the original iPhone, and Mac OS X before that) and, who knows, perhaps even the Anobit team is involved in this, but I find it hard to believe the iPad 3 is going to have the same thickness (or is it thinness?) of iPad 2 adding a new display, more RAM, a new processor and more powerful batteries. Batteries which, at some point, will have to use a completely new technology, as we can't just keep making them bigger every year. But let's assume Apple has got the iPad 3 hardware all figured out and they know to integrate Retina Display, A6 and LTE. 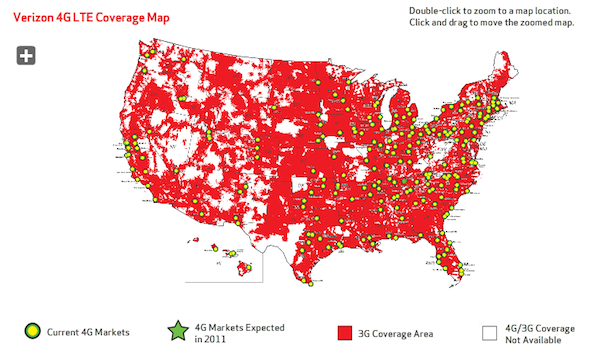 The question remains, who would benefit from LTE in 2012? According to recent data, Britain will get 4G networks in 2013/2014 with "wide availability" expected sometime during 2015. The situation is more or less the same in the rest of Europe: whilst Denmark and Sweden are one step ahead of other countries in LTE deployment (The Next Web has more on this), Italy, for instance, closed its auctions to assign the 4G LTE spectrum in late September 2011, with all the major carriers (Tre, Tim, Vodafone, Wind) getting a portion of the available 800 MHz, 1800 MHz, and 2600 MHz spectrum. When will these carriers begin LTE testing and deployment? The latest tidbits suggest preliminary testing in selected cities will become later this year (2012), with initial deployment -- but not "wide availability" -- expected for 2013/2014; moreover, the 800 MHz spectrum -- the digital dividend -- will become available to cellular frequencies after January 2013, forcing the carriers to postpone their LTE deployment or at least begin at a much smaller scale than other European countries. It appears Tre Italia (H3G) will launch LTE on the market in late 2012, although it's not clear as to whether it'll be a large rollout or an initial testing period with the usual four or five cities getting LTE. The LTE rollout timeframe seems to be pretty much the same across all Europe, with only a few countries having started testing in early 2011. French carrier Orange has confirmed LTE testing in Paris during 2012 and initial rollout in 2013; LTE auctions took place in Spain last summer, and the usual "initial testing" stages are set to begin later this year. Meanwhile, China is struggling with its home-grown TD-LTE standard as the rest of world is slowly adopting the more common FDD-LTE. Obviously, there had to be a rumor about Apple readying a TD-LTE "iPhone 5" for China Mobile but, as you know, nothing has materialized yet. 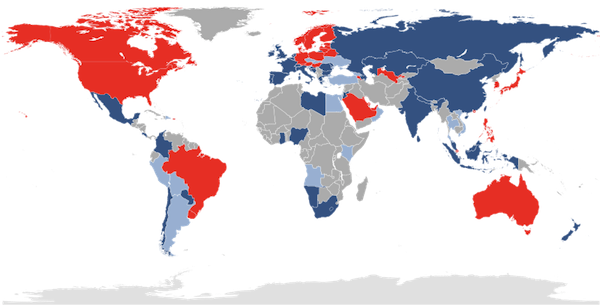 Wikipedia has a handy image showing countries with commercially available LTE services (red), LTE deployment "ongoing or planned" (blue) and "pre-commitment" LTE trial systems (gray) as of January 5, 2012. Compare this to a list of currently available HSDPA networks. 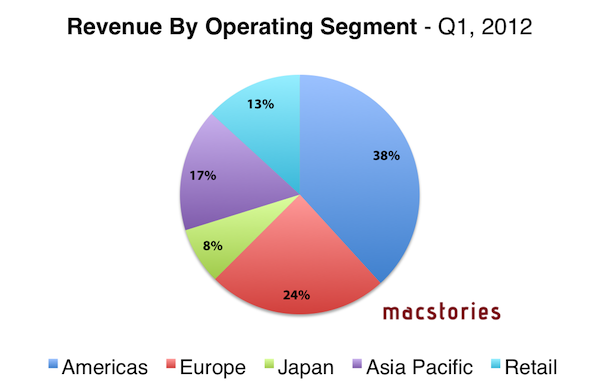 Also, a reminder about Apple's revenue by operating segment in Q1 2012. Apple doesn't make money in the US alone, unlike some would have you believe. 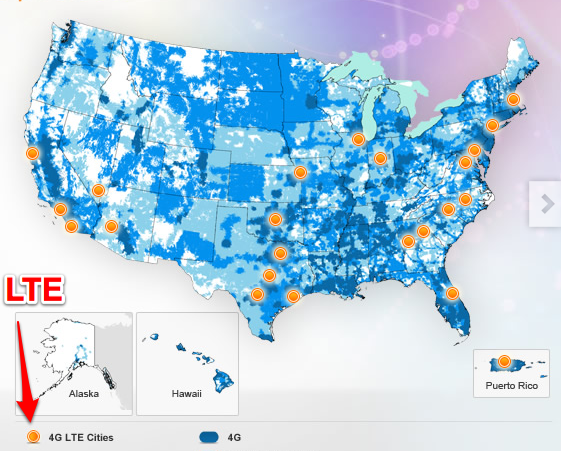 The data and images above depict the following scenario: LTE is very much still in its infancy with wide availability expected between 2014 and 2015, and the people who are clamoring for an LTE-ready iPhone don't realize that the U.S. isn't the only market Apple's basing its business on. Together, Europe and Asia Pacific are bigger than the U.S. for Apple now. Neither of them has a solid LTE strategy yet. Putting the rumors aside, it would be technically possible for Apple to implement LTE in the iPad and iPhone this year assuming that a) both devices are coming out after Qualcomm makes new LTE chips available (seems likely) and b) Apple has figured out a way to improve specs, preserve battery life and use LTE (we don't know). But here's a thought: if Apple's main concern is battery life and space on the board, why not begin the move to LTE with the MacBook Pros, just as with Thunderbolt last year? I imagine that Apple could begin testing integrated LTE chips in their computers, where they have more room for experimentation and battery life shouldn't be much of an issue -- but then again, we don't know what's going to happen to the MacBook Pro/Air line either. More importantly, I still don't see why Apple should invest heavily on LTE as the biggest feature for its top-selling product when very few of its customers have access to it today, or will in October of this year. If anything, it would make sense to wait for wider LTE availability, better chips from Qualcomm and the 2013 -S revision of the iPhone 5. But like I said, I'm not a person familiar with the matter.